Every step we take, we are struggling to reach paradise, an idyllic place where everyday problems disappear. We dream about our vision of paradise, struggling to get a little closer. This struggle is a journey and we often forget to look at the landscape along the way. Three strangers catch a train at 5.07am. An hour later, the train is derailed and all three are killed. What thoughts go through the minds of people who don’t know they are about to die? A series of conversations and situations, efforts to understand and be understood. A journey in search of paradise. 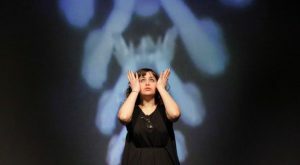 Catalan theatre company ATRESBANDES are rapidly establishing a reputation as creators of sharp, perceptive work for international audiences. Locus Amoenus is their fourth piece together and has been created in residence at mac in Birmingham, following the company winning the Jury Prize at BE Festival 2012. Catch Locus Amoenus in a double bill with My Champion Heartache or Egg on the same evening. Two shows for just £16! ATRESBANDES are a Catalan company based in Barcelona with a number of international collaborations and awards to their credit. Influenced by a diverse range of disciplines, the essential thread to the company’s work is the collective creative process. They seek to question everything around them and believe that doubt and uncertainty are as important as mutual understanding.